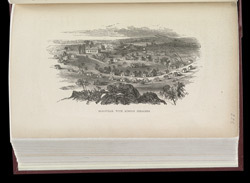 Illustration from James Mursell Phillippo's 'Jamaica: Its Past and Present State,' depicting the village of Sligoville in the parish of St Catherine. In anticipation of the abolition of slavery, Phillippo, a Baptist missionary, bought land in the hills of St Catherine. The land was divided into small plots which were then given to freed slaves so that they could make new lives for themselves. Sligoville was the first free village and was named after Howe Peter Brown, the Marquis of Sligo.